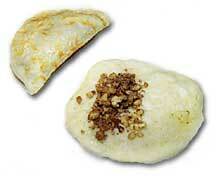 Qatayef is universally popular with Muslims, especially during the month of Ramadan. To achieve optimal flavour, adhere to the directions, i.e., no making do without the rose or orange blossom water in the syrup, or by not adding cinnamon to the filling! In a saucepan add the sugar to the water and bring to a boil. Add lemon juice and boil for 2 minutes. Add rose or orange blossom water, take off heat and let cool. Mix together the walnuts, sugar and cinnamon and put aside. Pour water into a generous size bowl. Stir in yeast and sugar and leave for 15 minutes to proof. Add flour, wheatlets and salt, and mix until smooth. Add 125 mL (1/2 cup) of the melted butter and stir again. Place in a draft free place for half an hour or until it has foamed and formed air bubbles. Stir and put aside for another half hour. Stir. Fill the crêpes while they’re still warm; they’ll tend to seal easier. Place one tablespoon of the filling on the uncooked side of the crêpe, fold over and seal by pressing the edges with your finger tips. Brush both sides generously with the melted butter and lay on a greased baking tray. Before serving, place crêpes in the oven and warm up thoroughly. Pour syrup over individual servings. Note 1: Crêpes may be filled with sweetened ricotta cheese.